Under Armour is a popular American athletic apparel brand that sells clothing athletes and struggle-athletes love. Uncle Martian is not...yet. In an impressively shameless move, a Chinese company launched a premium sportswear line this week that has a very similar logo and mission as Under Armour. The company behind Uncle Martian is a 25-year-old sports shoe manufacturer, Tingfei Long Sporting Goods Co. (廷飞龙体育用品有限公司). According to its government records, it has some 800 employees and is based in southern China’s Fujian province. 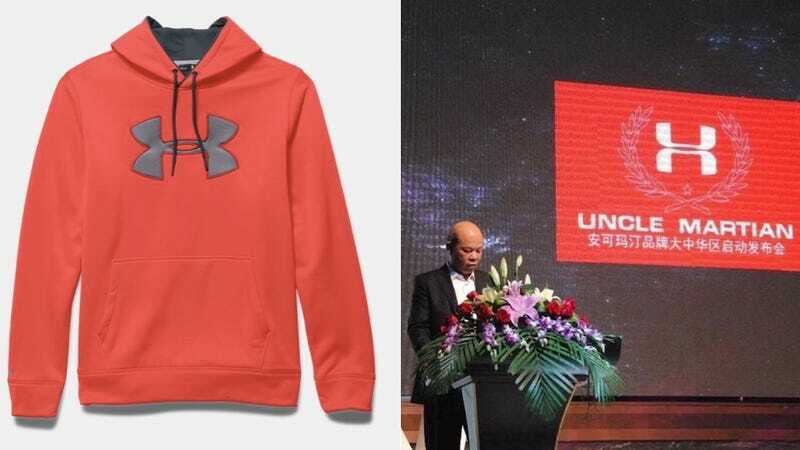 Tingfei GM Huang Canlong even directly referenced Under Armour in a recent interview while laying out his company’s goal to compete with strong U.S. sportswear brands. Netizens on Weibo are tweeting about the brand’s likeness to Under Armour, and many are slamming Uncle Martian for its lack of creativity. Some said it should expect a copyright infringement suit from the American firm real soon. I say, let Uncle Martian live.